Arletta Case had a passion for traveling. She visited all the continents except Antarctica during her life time. The Clay County English teacher also loved writing. One of her trips took her and friend, Kay Harper, to the town of New Harmony which lies along the Wabash River in Southern Indiana. She was fascinated by the history of the people who developed that town in 1815. The Harmony Society was a sect of people who believed the world would end during their life time. The Lutheran Church Separatists from Wurttemburg, Germany, encouraged celibacy even for married couples because they didn’t think children should be brought into a world that would end before they reached adulthood. The Harmonists also were known for their worldly success in agriculture, factories and inventions in their utopian community. That visit and her passion for writing eventually led Arletta to write a book about the Harmonists. She toiled over it for years as a labor of love. Her research gave her a vast amount of knowledge about the Harmonists, also known as Rappites after their founder, George Rapp. The Harmonists initially settled in Pennsylvania, calling their commune Harmony, but moved to Indiana to get more land and a better growing climate. For various reasons, however, the Harmonist Society moved back to Pennsylvania in 1825. The Indiana settlement was sold to Robert Owen and he renamed it New Harmony. In Harmony all property was held in a common fund. The members gave all of their possessions to the community and promised to cooperate in promoting the interests of the group. They agreed to accept no pay for their services. Members would receive care and their needs would be met as long as they lived with the group. Arletta enjoyed the research and the writing. The Parke County native had lived on the family farm in Bridgeton but moved to Brazil in 1976 a year after her husband died. The mother of four was teaching at the Brazil Junior High School and wanted to get closer to her work. 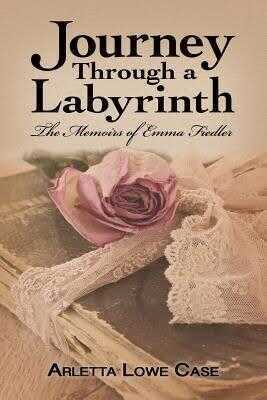 Her book, “Journey Through a Labyrinth: The Memoirs of Emma Fiedler” is an historic/ romance short novel. At the age of five, Emma comes to America with her parents to escape religious persecution in Germany. Her parents die in route and she is taken in by the Fiedler’s who raise her. The book tells of the life, loves and heartaches of Emma Fiedler growing up a Harmonist. It gives a verbal picture of the scenic beauty of New Harmony and a historically accurate description of the inner workings of the Harmonist Society. Kay Harper, Arletta’s friend and a former history teacher at Northview High School would like to see the book in the Clay Communities Schools libraries. Besides being an entertaining story, she thinks it captures detailed facts pertaining to a segment of Indiana history. The book was accepted for evaluation by a publishing company but was not published before Arletta died August 2, 2010. Last year Arletta’s children decided to complete the process for their beloved mother. Her book can be purchased, hard cover-$15, paperback-$10, online at Books-A-Million or Barnes & Noble.